Have you ever bought a pre-sliced loaf of bread? You know that when you look between the slices you can tell if there is anything wrong with it. That is how Computed Tomography (tomo-slice; graph-picture) works. The target body part is put through a virtual “bread slicer” that creates slice images with tiny intervals. At IPMC a CT scan is performed using a 64-slice Siemens Spiral CT Somatom Sensation, which is a non-enclosed scanner so there is no danger of claustrophobia. The patient rests comfortably on the table while cross-sectional images are taken and digitally assembled to form an extremely detailed view of the bones and soft tissues. Though, since its introduction in the 1970’s computed tomography has been widely used for diagnostic purposes, it is now being used for preventive screenings as well. This is especially true for patients with a high risk of cancer and for cancer survivors. The CT scanner uses x-rays to create images, but constant advances in technology have allowed Siemens to drastically reduce scanning times and radiation exposure. Nevertheless, radiologic procedures should always be done cautiously and only when necessary. That is why we never perform any tests without a valid prescription from a doctor. A CT can be performed on virtually every part of the body, so there are many different types of scans with different applications and preparations. Your doctor will decide which procedure is better suited for you. Dependant on that, you may be given an oral or intravenous contrast agent. In many cases you will be given both. For the safety of the patient there is a careful screening process for all contrast studies. 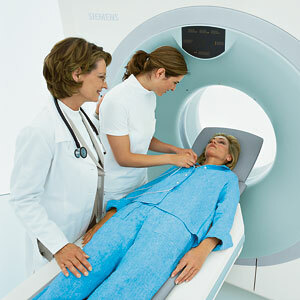 Please see our section on how to prepare for your CT scan.